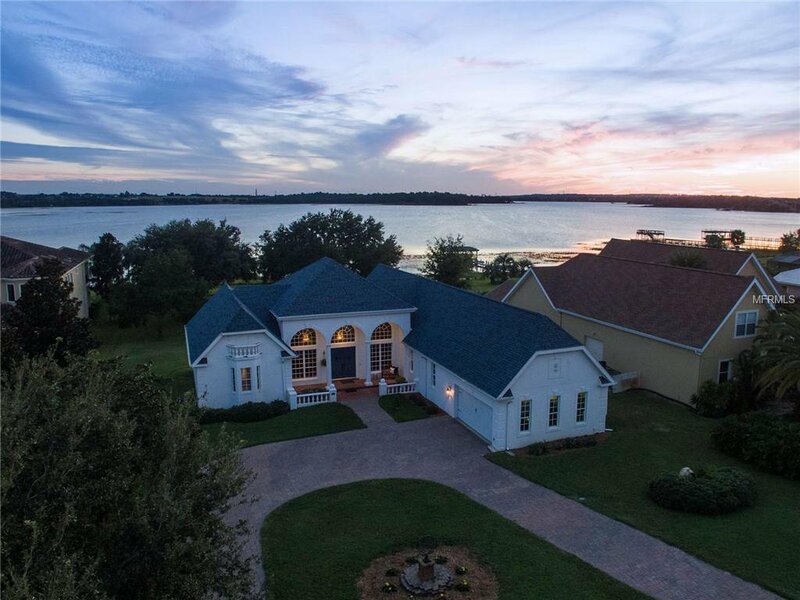 Stunning English Manor, John’s Lake Front Custom Estate In The Exclusive Deer Island Community. Sits On Just Under One-Acre Lot With 113 Feet Of Water Frontage With Dock And Covered Boat Slip. One-Story Beauty - Split Bedroom Plan With Tile Floors Throughout. The French Double Entry Doors Open To Spectacular Lake Views Featuring The Six Palladian Windows With Decorative Frames In The Formal Living And Dining Rooms Highlighting 17- Foot Ceilings With Custom 12 Inch Crown Molding. Appreciate More Lake Views From The Owners Suite-Bathroom Has Double Ceiling Crown Molding, Plantation Shutters, Updated Garden Tub, Glass Block Walk-In Shower, Framed Mirrors And Double Marble Sink Vanity. Chandeliers And Crown Molding Are Features In The Two Additional Bedrooms With Shared Adjoining Full Bath. A Hobby/Office Room Is Strategically Placed Between The Garage Entrance And Spacious Laundry Area. Open Style Kitchen Offers Smooth Cooktop, Stainless Appliances Including Range Hood, Wall Oven, Microwave And Warming Drawer. There’s Plenty Of Solid Surface Counters, The Oak Cabinets - Some With Seeded Glass Doors To Display Special Dinnerware. Enjoy Remarkable Views Of Johns Lake From The Adjacent Open Family Room With Dinette area. Imagine Yourself In England In The 1800’s Holding A Lavish Croquet Party On Your Very Own 100 X 50 Clay Court – Other Features Include Dual HVAC Units, Security System, Culligan Water Filtration System And Metered Sprinkler System. New Roof In 2016 With Transferable Warranty.